At the beginning of chapter four John is raptured up into Heaven in what I believe is a symbolic form of the Rapture of the Church before the Tribulation begins. Then, in chapters 4 and 5, John describes a glorious Heavenly scene of God's marvelous throne where God is surrounded by a heavenly chorus and by 24 elders. In front of the throne there are guards — four strange creatures which are representative of all of God's creation. At first, John is just dazzled by all of this and he's left speechless. He just focuses on the never-ending worship that goes on before the throne of God. But, at chapter five, John's attention in suddenly diverted. His attention is diverted to a little scroll in the right hand of God. John seems to immediately sense the significance of this scroll because it's revealed in chapter ten that this scroll is the title deed of the earth. Oh, John wants someone to open that scroll — someone to claim it — somebody to claim the dominion over this earth that Satan stole in the Garden of Eden and claim it back for mankind. A strong angel suddenly appears and the angel says, "Who is worthy to open the scroll and break its seals?" In other words, who is worthy to reclaim dominion over the earth, taking it back from Satan? John looks around and no one appears to be worthy. John begins to weep, and as he is weeping one of the 24 elders steps up and he says to him, "Stop weeping, behold, the Lion of the tribe of Judah, and the root of David has overcome so as to open the scroll and its seven seals." When John turns to look at the lion he doesn't see a lion, instead he sees instead a little lamb standing as if it were slain. He looks for the lion and he only sees a bloody lamb. The Lamb goes up and the Lamb takes the scroll the Lamb opens the scroll and all of the Heavenly hosts breaks forth in song, "Worthy are you the Lamb to take the scroll and to break its seals for you were slain and did purchase for God with your blood men from every tribe and tongue and people and nation." Wow, what a glorious scene that must have been! In chapter 10, we are presented with a flash forward to the end of the Tribulation that shows Jesus as a mighty angel at the Second Coming. He comes back and He puts one foot in the ocean and one foot on the land to symbolize that He has come to reclaim dominion over all the world for you and for me. He has in His left hand that little scroll that is open. We're told there in Revelation 10 that He will cry out with a loud voice as when a lion roars. That's what will happen when the Lord Jesus Christ returns. 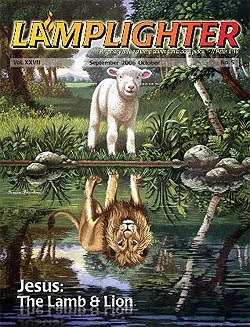 Well, strangely, throughout the rest of the book of Revelation John uses lamb imagery instead of lion imagery. He uses the lamb imagery over and over and over as he talks about the Messiah pouring out the wrath of God during the Tribulation. It is the Lamb who is pictured as pouring out the wrath of God. Look at Revelation 6, "The Lamb broke one of the seven seals launching the Tribulation and the kings of the earth and the great men and the commanders said to the mountains and the rocks, fall on us and hide us from the presence of Him who sits on the throne and from the wrath of the Lamb!" Isn't that interesting how He begins to revert to the use of the Lamb as the one pouring out the wrath of God? In Revelation 17 John says, "These will wage war against the Lamb and the Lamb will overcome them because He is Lord of Lord and King of Kings and those who are with him, they are the called and they are chosen and the faithful ones." It is the Lamb who is waging the war in our behalf. I believe that John emphasized the Messiah as our lamb because that symbol shows the great price that Jesus paid for the sins of mankind as He hung upon the cross as the suffering lamb. It also reminds us of the Lamb's vindication as He returns to take earth's dominion away from Satan. And, it emphasizes Jesus is going to receive the honor and the glory that He so richly deserves — the honor and glory that He was denied when He came the first time as the suffering lamb. As we wait for the fulfillment of Revelation's prophecies, let us do two things. Let us exalt the Lamb and let us yearn earnestly from the depths of our heart for the Lion. And, as we do so, let us cry out from the depths of our hearts, "Maranatha! Maranatha! Maranatha! Come quickly Lord Jesus! Amen." Sure thing - Kamikaze Post-Tribulation Rapturists. It's under the 2008-June link. "What is a true prophet? We decide by asking, “what does the Scripture say?” Giving an argument from human reasoning is not sufficient to arrive at the truth. We can only determine the truth from what God has spoken to us. Moses said “And if you say in your heart, 'How shall we know the word which the LORD has not spoken?--when a prophet speaks in the name of the LORD, if the thing does not happen or come to pass, that is the thing which the LORD has not spoken; the prophet has spoken it presumptuously; you shall not be afraid of him” (Deuteronomy 18:21-22). If a prophecy from a prophet failed to come to pass, the people were told to rid themselves of the prophet by no longer paying attention to him". Expected...another guy at my work and I occasionally get into "pun fests". You went with it and gave me a good LOL! Were you accusing us regulars here (the "posties" - is that us?) of "slanderous gossiping busy bodies by accusing the brethren...yet when their misrepresentations are challenged, they resort to name calling with such fury"
If one of us were to post something out of our character I'm sure Nathan would step in and comment or delete it or we ourselves would make it right. Overall, I think we are a very nice group here and I'm proud to be a part of it - and feel BLESSED to be a part of it. Expected...Now I know what you meant by posties (not us). Glad to hear that!!! Must be quick, I am cooking our evening meal... This is a must see even if you disagree! I second "Thunders" motion.....You should join us over in the facebook group in addition to this group here. There is a link to it here on Lamb & Lion. Hope to see you there soon. If you join us, be sure to drop your "handle" here,I.E,over there. So we will know it's you. Oh and by the way.....Billy & Hartdawg....are either of you part of the Facebook group? Or is it just Thunder, Nathan, and myself??
" --For a second I thought you'd misspelled something less pleasant".